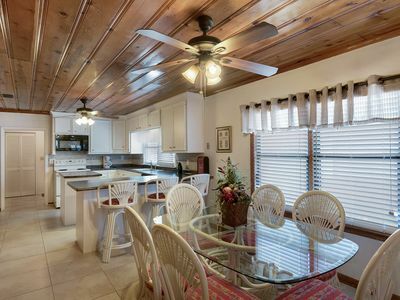 Completely Updated 3 BR Corner Unit - Hardwood Floors, Linens, Paint -- 5-Star!! 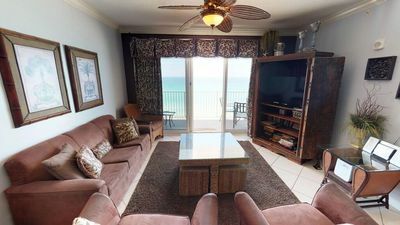 Welcome to our Gulf Front condominium home! Our home is located in Majestic Beach Towers Building 2 on the 14th floor. 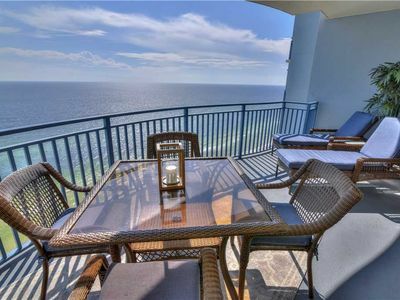 If you are looking for one of the nicest, cleanest condos at a very reasonable rate, you have found your match! 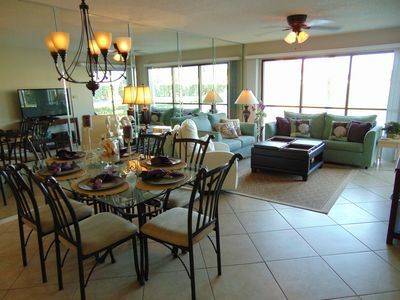 Our condo/home has been furnished above and beyond what you will normally find. Rated at the five-star platinum level, we have spared no expense for ourselves when we stay as well as for you when you choose to stay with us. We have just upgraded all our flooring throughout the entire condo. Hardwood floors are in the bedrooms and tile throughout the rest of the condo. You won't find that expensive upgrade in many units! 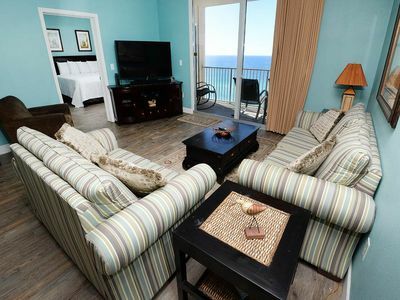 A little about our condo tower, Majestic Beach Towers I and II are two of the most amenitized buildings on our coast. 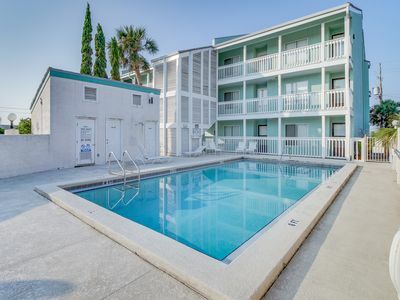 Featuring 650 feet of Gulf frontage, a market with Starbucks, three outdoor and two outdoor pools including splash pool and waterfalls and two hot tubs. 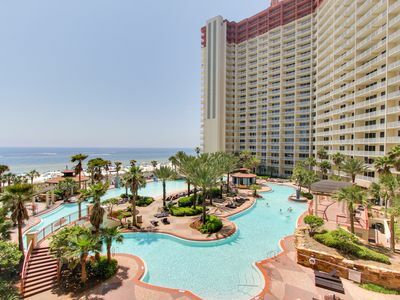 Majestic Beach Towers also features a 130 stadium seating movie/presentation theater, conference facilities, fitness center (fee applies) with steam and sauna rooms, poolside bistro and bar, and covered garage parking. 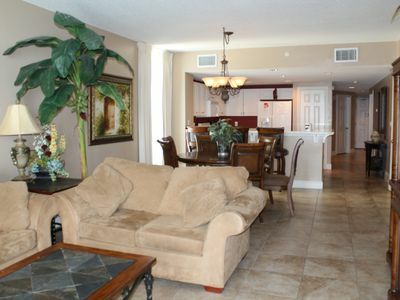 Our spacious three-bedroom, two bath condominium home is professionally decorated with thoughtful attention to detail to make your stay as comfortable and enjoyable as possible. Want to prepare your own meals? 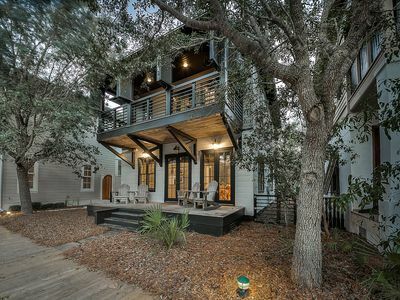 The kitchen in this home features solid surface countertops, GE appliances, built-in microwave, breakfast bar, upgraded cookware, dishes and stemware. The dining room seats six comfortably and you and your guests will enjoy a wonderful evening eating in. 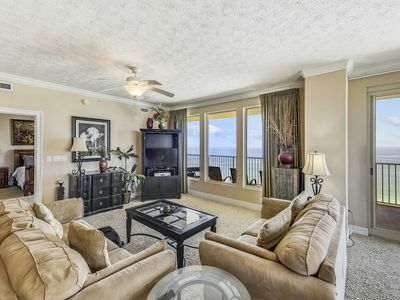 The living area features nine foot to ten foot ceilings, flat panel TV and DVD player, and a ceiling fan. It also has a wet bar with ice machine. The couch converts to a queen-size sleeper/sofa for additional sleeping options. 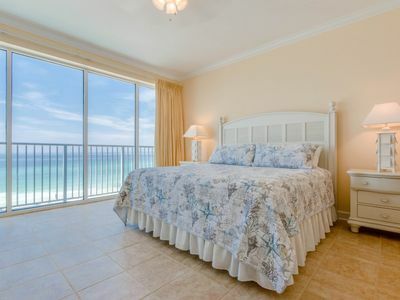 The master bedroom has a king size bed, TV with DVD player, and enjoys Gulf front views. It has a very comfortable bathroom with jetted tub and large shower. 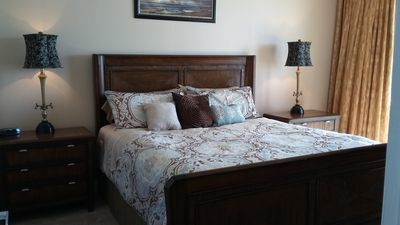 The second bedroom has a queen size bed and TV and also a private balcony. The third bedroom has a twin over full bunk bed that comfortably sleeps three people. 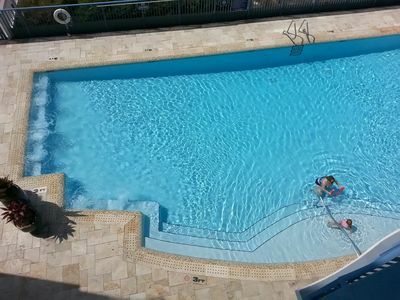 Free wireless Internet access is available in the condo and throughout the pool area, lobby and common areas of the Resort. The condo also includes a full-size washer and dryer. As the pictures show, this incredible experience is just what you are looking for and we guarantee your stay will be the best vacation of your life. We are happy to answer any of your questions, give us a call or email inquiry today. You will not find better customer service, or people who are easier to work with than we are. We make the process simple and carefree for you and your family! Calypso Beauty! 7th Floor West Tower. Pier Park right next door!! 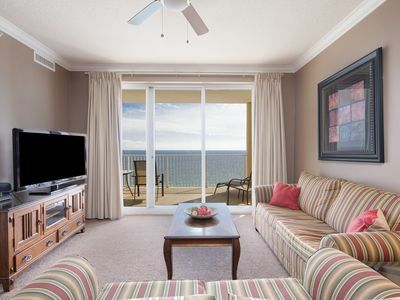 Multi-level seaside condo w/ easy beach access, shared pool, & water views! 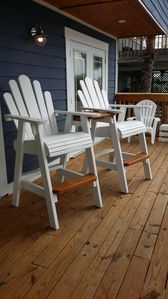 Tidewater 1108 - Don’t miss your spring vacation. Book now!